The Petersons are working together to clean up a camp ground near Loon Lake, where they will be spending time this summer. Charles and his neighbor Sammy are working hard but also having fun, but the day takes an exciting event when their mother calls from home to say that a dog has been abandoned... at Loon Lake. Sure enough, in a carrier in a parking lot there is a puppy. When the group approaches the dog, they find that it is a very large type of Newfoundland, a Landseer, who is skittish around so many people. They manage to calm it, and Charles and his sister Lizzie figure that they will foster it, but large puppies have special needs, especially as they grow into even larger dogs! 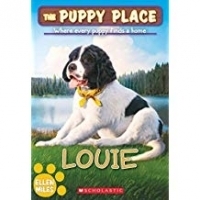 Because the dog is so large, the boys, including Liam and twins Hunter and Tyler, decide that training Louie should be a Cub Scout project. They work very hard to train Louie so that he will be easier to adopt. Eventually, the people who abandoned Louie come forward, saying that they regretted leaving him the way they did and returned very soon to the parking lot, but the dog was already gone. In the end, Louie's training goes well, and his new home is easier to find than the boys could have expected.